I've produced a new "resources for artists" information website called The Best Art Business Books. Many thanks to all those who are already tweeting it and 'liking' it on Facebook! Why did I create this new site. Well - as I've indicated before (Making A Mark - Amazon assigns ludicrous categories to Art Books 11 May 2010) it's sometimes really, really difficult to find the book you're looking for on a topic you're interested in on Amazon because of the way they are categorised and tagged - sometimes with very odd labels. What I've also noticed is that there has been a fair few new books relating to the art business which may be of interest to artists - if they ever came across them! So what this new site aims to do is provide a curated collection of the what appear to be the better books on Amazon which are about the art business and the business of being an artist or illustrator. I've tried to sort books into appropriate categories and these relate to artists, illustrators, people selling in galleries and in less traditional venues, those setting up galleries and those who collect art! Do you want to learn more about the business of being an artist? Looking to improve your marketing of your art - and your sales? Want to make the jump to full-time artist or illustrator but not sure what you don't know that you need to know? Thinking about setting up and art gallery and looking for tips? Need a form for an art business transaction? Seeking legal advice on some aspect of the art business? Starting to collect art and wondering whether there's a book that can help? 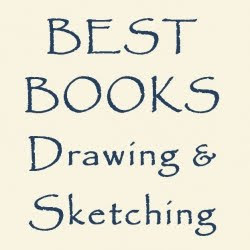 If any of the above apply then The Best Art Business Books has a book which can help you. This selection of books about the business of fine art and illustration are a combination of my own personal recommendations, recommendations by artists and art bloggers I know and rate highly and books which have achieved a high rating on Amazon. These are the topics which it covers. This is still a work in progress as I add in links to artists and illustrators who have blogs and posted a review of art business books they have read. I'd be interested in your impressions and suggestions for how it could be improved. Do you have a favourite book about the art business which you have found helpful? Do you have a book about the business of being an artist which you have reviewed on your blog? 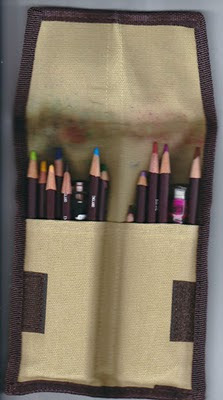 I've been testing the Derwent Pocket Pencil Wrap and have to say I'm very impressed. It's rapidly becoming a favourite bit of kit for a minimalist approach to sketching. As you can see from the photo it's become very well used very quickly! The solution to the marks on the canvas - which bother me not one jot - is to turn the pencil the other way round as shown in the packaging. I just prefer to have my pencil points up top! The pocket pencil wrap was launched in March and you can find my review below. artists who like putting all their sketching kit inside their jacket and trouser pockets - like David Hockney - will love it! also of interest to people who want to take any sort of drawing implement out of their studio - it doesn't have to be a pencil! Caran d'Ache has made a change to their Luminance 6901 range of coloured pencils which means it's very likely that I'm going to start investing in more colours. Basically these are two design flaws which are pretty big in terms of the functionality of choosing which pencil to use next! I really love the pencils and their pigment rich coverage with lightfastness guaranteed - but they were frustrating to use. In practical terms I was always having to inspect a Luminance pencil prior to using it - and that just became irritating. However I guess a lot of people must have complained or fed back to Caran d'Ache saying that they weren't too ecstatic about the arrangements for identifying colours, because the company has now changed the pencils! The Luminance pencils now have a new colour cap on the end. It's not as big as the colour on the Lyra Rembrandt pencil but it's a start in the right direction. I'd personally have liked to see it a tad bigger but this is a LOT better than the previous arrangements for colour identification. The change will make it much easier to see what colour the pencil is when you go to pick it up. 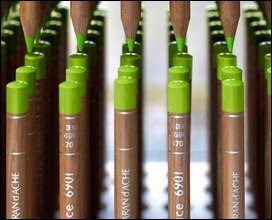 Now if we could persuade Caran d'Ache to name the pencils along the barrel of the pencil I'd have a pretty big smile on my face! 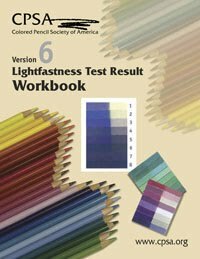 Version 6 of the CPSA Lightfastness Workbook was published at the beginning of May. The workbook provides a set of sheets for all the different brands of coloured pencils. CPSA has been working its way through all the brands since it published the first version. Each sheet records the name and number of each coloured pencil which passed the lightfastness tests for every brand of artist grade coloured pencil in production. Which is another way of saying I can't think of any which are not now covered by this book. 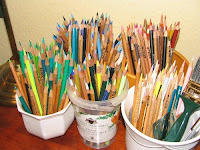 The lightfastness tests are conducted according to the international art materials standard for coloured pencils approved for this purpose in 2003 - which you can find explained on my website page about lightfastness - An overview of the lightfastness of reputable coloured pencils. If you want to know whether or not the colours you are using are acceptably lightfast or better (ie rate 5.5 or better against a blue wool card under approved test conditions) then I strongly recommend getting hold of the lightfastness test results. I've personally seen some of the original blue wool cards which were used and the way some of colours had bleached to nothingness when exposed to light! That means the cost of this book is as detailed in the table below. A fully paid up member of UKCPS living in the UK would need to pay $68 for this book. I can highly recommend it - although I do wish CPSA would price it to make it more accessible for UKCPS members. 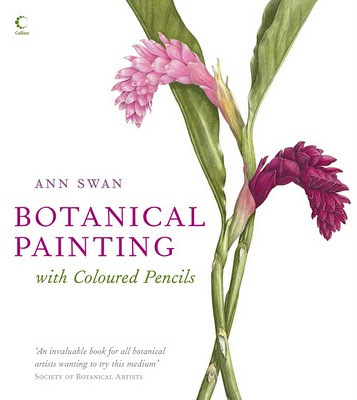 I know many members who would like to order a copy but who have been completely deterred by the huge cost to overseas artists who are not members of CPSA. I'm sure an agreement could be reached for mutual benefit if there is goodwill and effort applied on both sides. A greener option? Another option which I hope CPSA will seriously consider is to produce the book on CD or DVD so that members could print off only those pages they needed for the brands of coloured pencils that they own. That would be a much greener option, would help cut costs of production and postage and would save a few trees as well!